Crosible Filtration supplies high quality Liquid Filter Bags, Dust Filter Bags, Filter Plates, Filter Presses. All our filter cloths and dust bags are manufactured at our in-house facility. Crosible also specializes in a range of small filter presses. Crosible leads in innovation, quality service and technical expertise. We are committed to provide effective solutions to the problems posed by today's sophisticated filtration installations. 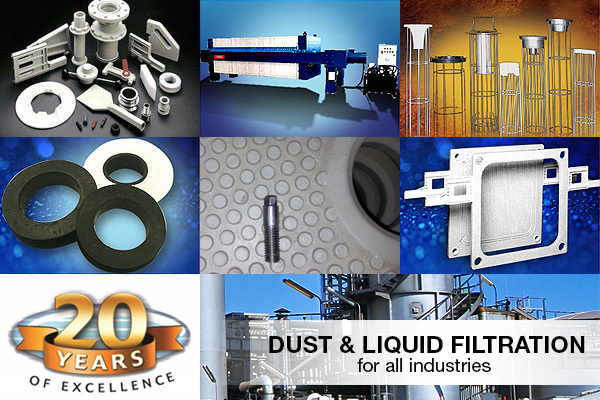 Crosible South Africa was established in 1996 and are market leaders in providing filtration solutions to industry. All our filter cloths and dust bags are manufactured at our in-house factory in Tarlton, Gauteng, South Africa. All cloths and bags are manufactured under strict quality control procedures and all cloths are woven to ISO 9002 specifications. Crosible is the only filtration company to offer an after hour manufacturing service for emergency breakdown situations. Crosible Filtration exhibited at the 2016 Electra Mining. Crosible Filtration Exhibited at the 2015 Electra Mining. A wide variety of filter plates are available to suit any process. 470 mm to 2000 mm plates. Crosible specializes in a range of small filter presses. Limiting our range from 2 sqm to 50 sqm. Crosible’s dust filter bags are made from a wide selection of filter media. Crosible cages are custom built in 10 / 12 / 16 / 20 longitude wires. Rubber Evoprene necks are sewn into the feed ports to combat aggressive abrasion and premature wear in the neck area. Various sizes are available for the various thicknesses and port diameters. CrosTex is a micro-porous Teflon membrane (ePTFE) bonded to the surface of conventional filter media, to both woven cloths and needlefelts. We supply a wide range of milling mesh. We manufacture and supply a wide range of Milling Bags & Cages. Crosible cages are custom built in 10 / 12 / 16 / 20 longitude wires using mostly 3.15 and 4mm steel wires.